In Dead by Daylight, each time you expand your blood web to levels you get items, offerings, add-ons and also perks. Now, each survivor has a certain character and corresponding properties that are defined in terms of these benefits. Therefore, over time everyone gets access to 3 very special perks or special skills, and it is important to determine who is the best survivor in the game because Survival in this horror game is highly dependent on the survivor you are playing. In the game, you will find the following five survivors. We have been playing the Dead-by Daylight for quite a while now and have met both the killer and the survivors. But basically cannot be determined as a flat rate, who is now considered the best Survivor. Finally, it is important who exactly the best character in the game and have to consider your playing style. In terms of the best survivor in Dead by Daylight, and in the end all the perks of each Survivor, which incidentally have 6 different levels and each level 3 in detail. That is why we want to introduce you to these benefits in the following sections in more detail, so you can decide what really matters when playing the Dead by Daylight. then only you can choose the best survivors for you. In sprinting athletic Meg Thomas makes anyone of something. He is more of a lone wolf. But he can also be used for the team: Depends someone on the hook, and he can distract the killer and the survivor can be saved, then Meg is perfect because he can lure the killer off the hook. Sprint Boost: Meg can sprint while a maximum of 50% for maximum 3 seconds to run faster than others Survivor. There is a cooldown of 60, 50 or 40 seconds before you can use again this boost. Adrenalin: When the exit gates are supplied with energy, Meg automatically recovering from injuries. This applies even death injuries, but only from Level 3. In addition, he runs 50% faster (3 to 5 seconds). Unfortunately, the perk does not work if the Survivor is blocked by anything. Quick & Quiet: When jumping over obstacles or the opening and closing cupboards and chests Meg is quieter than other survivors. Thus, the perception radius of noise is reduced for the killer 30, 60 or 90%. Leader: Hold another Survivor in a radius of 8 meters, then his speed increases in healing, repair and sabotage by 3, 6 or 9 percent. 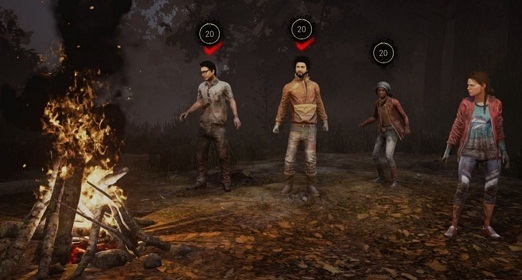 Prove yourself: Dwight gets a speed boost in healing, sabotage and repairing when there are other survivors in a radius of 8 meters to him. Binding: to keep other survivors within a radius of 12, 24 or 36 meters around, he can feel their aura. Botany knowledge: Both the own rate of healing as well as those with Medikits is increased: 10, 15 or 20 percent faster. Self Care: Claudette heals herself without the need for a health kit. Depending on the level she makes in a specific speed, either 30, 40 or 50% faster. Empathy: Claudette sees the auras of dying or injured survivors in a radius of 32 or 64 meters. At the highest level she always looks like the auras, no matter how far others are removed from it. Saboteur: Without a toolbox to help, it's possible Jake to sabotage hook, so that they are unusable. The tamper speed increases depending on the level of 30, 40 or 50%. If he uses a toolbox here, then the rate increases further and that up to 50, 75 and finally even 100%. However, you have to expect a lower skill check-Range, this shortens by 20 or 10%. Tranquility: crows are annoying companions in Dead by Daylight. Jake can pas them, then they are not disturbed anymore. At least reduces the chance that they will do it to 70. 80 or 90 percent. Iron Will: Jake can stun his pain, well, rather he travels on the belt and not have compassion on rum: if he's hurt, reduce by 50 or even 100%. But that's only if he stands still. When the highest level is reached, the noise is reduced and also when running. Balanced landing: Reduced affects on long fall. Urban Evasion: Nea can hide Secretly, almost cunning. Her movement speed is increased when she is in a crouch and moved bend. Streetwise: The long nights alone, Nea made smarter. The exchange rate of items is low with her than with other survivors. Sorry, no percentages in Nea Karlsson are yet published and even we have not played yet with this character. As you have seen, each Survivor has his / her advantages and disadvantages. So if you are still unable to decide the best character for your gameplay then you can also follow the discussions "Dead by Daylight - Best Survivor" on Steam. Hi there! This guide was very useful, but I have a question. Can survivors learn other survivors perks? Because I have Nea as my main character, but I would love it if she could learn Saboteur and self heal. Thank you!